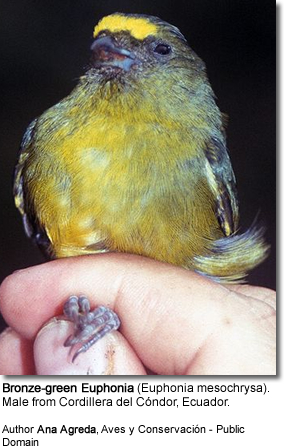 The Bronze-green Euphonias (Euphonia mesochrysa) - also known as Bronze-bellied Euphonias - are South American songbirds that belong to the finch family. They occur naturally in countries of Colombia, Ecuador, Peru and Bolivia (north and northwestern South America). Range: Colombia (at the head of Magdalena Valley in Huila; and the eastern slope of the east Andes mountain range, from eastern Cundinamarca and western Meta); south to eastern Ecuador (provinces of Napo and Morona-Santiago). Range: Northern and central Peru on the eastern slope of the Andes mountain range (Amazonas and Cajamarca); south to the Peruvian region of Cuzco (along the Chanchamayo River). Range: Southeastern Peru - south from the Tavara river; south on the eastern slope of the Andes to the Bolivian Departments of Cochabamba and extreme western Santa Cruz. Euphonias are known for their almost constant singing. Their best known calls sound like "Pe-we," "see-see," and "beem-beem".